Let me introduce you my new neighbor flatmate: Totoro! 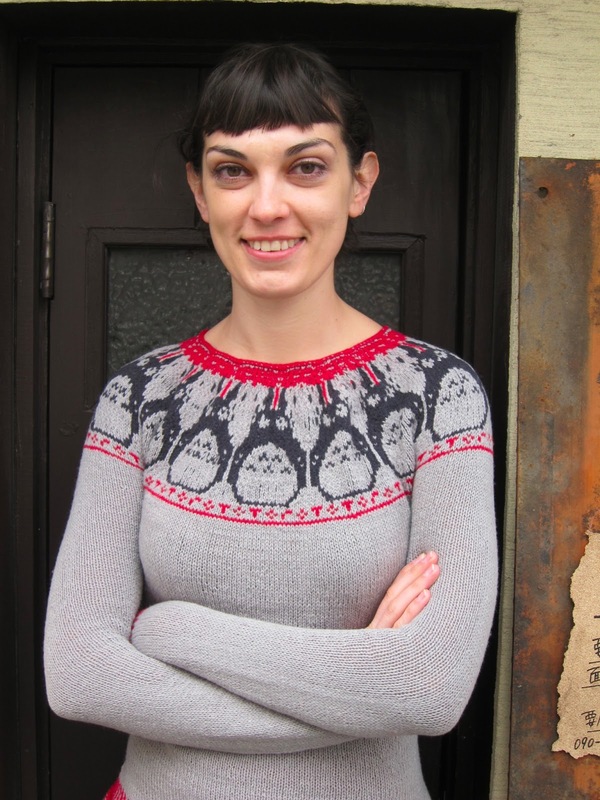 In fact, there are 13 Totoros sitting on the yoke of my jumper. It all started from Ravelry: I was searching for a new pattern of something warm and cuddly. First I saw the original Paper Dolls by Kate Davies, Scottish knitwear designer. But then my eyes caught one of the jumper's variations: TOTORO! On the same day, I ran to the yarn shop. Thus began two weeks of Totoro-mania, because not only did I knit Totoro, but I also watched the movie and sang karaoke Totoro songs. If you don't know Kate Davies and if you are into knitting or pictures of gorgeous Scottish scenarios, I would tell you: go check out her site! 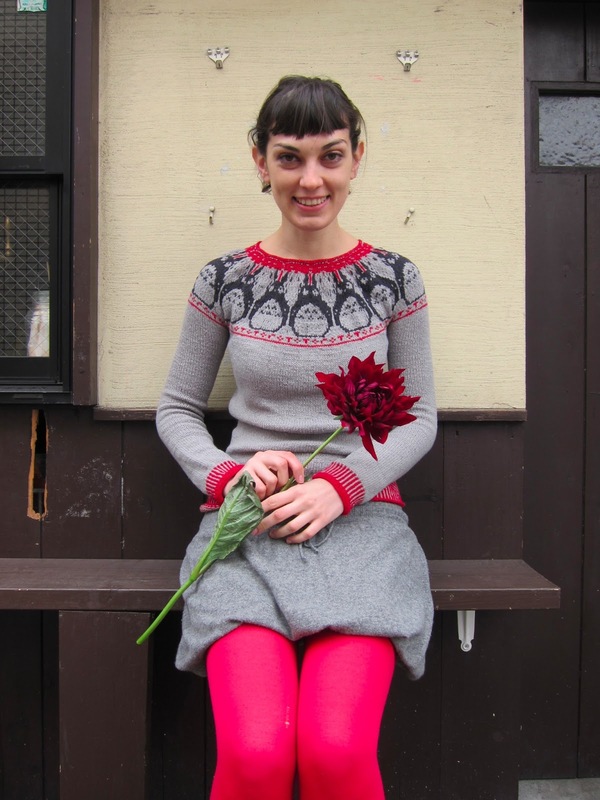 Several more of Kate's designs are on my knitting list; seriously, who can resist????? The thread for this jumper is an amazing mix of 80% wool and 20% LAMB LINEN from Avril: 1200m of the main color, and less than 100m of the two contrasting colors. NO, no, I did not forget about sewing! Yesterday I even accepted a sewing dare from Gillian which is to finish my Matthew Williamson dress by the end of next week! Ahhhhh!! I love this! It's so, so cute! I love Kate Davies, too! I'm in love with this sweater! So cute! Great job! Wow. This is seriously gorgeous. And Cosy. mmmm. Damn all you people who can knit, I intensely dislike you!! Don't despair! Knitting is easier than sewing. You can learn knitting using tons of online ressources including YouTube. But I would be also willing to show some basics, if you like! Wow wow! Your jumper is amazingly knitted and cute to boot. So happy to hear the you have been dared to finish your Matthew Williamson dress. Oh. My. God. I need to learn how to knit. And then I shall sing Tototro... to.. to... ro... over and over again whilst I make the world's best jumper. It looks amazing!!! Well done! O_O I'm speechless! Oh I wish I have the patience and ability to knit like you! It's not true! Your knitting skills are amazing! Too bad we don't see much scarfs and mittens coming out your needles! Wow! That's awesome!!!! Have you been getting lots of comments about it from people on the street? "Aaaa Totoro! Kawaii!!!" and giggles: typical reaction here. I can't believe you made this. Looks immaculate! Esta perfecto!!!!! Madre mía... tus agujas son mágicas!